A toddler floating swimsuit can provide your child with extra confidence in the water and keep him safer as he learns to swim. Get tips on how to properly fit your child for one of these suits and find out where to shop. How will you teach your toddler to swim? Many of us have taught our children to swim using a variety of flotation devices to keep those little heads above water, including water wings, Styrofoam half-boards and inner tubes. The drawback to these swimming aids is that they are easily separated from your child. It's all too easy for a toddler to let go of the tube and slip though the hole. Water wings can work their way down and off of slender arms, and tiny hands can lose their grip on wet Styrofoam. The toddler floating swimsuit is a refreshing alternative to standard swimming aids. A combination one piece suit and life jacket, this type of bathing suit is made to definitely remain on your child in a way many other flotation devices simply can't. Floating kids' swimsuits are generally manufactured using one of two designs. Some suits have a floating foam insert permanently stitched right into the garment. Other suits contain inflatable air packs to be tucked into zippered compartments throughout the vest area of the suit. With either style, the result is the same. You wind up with a swimsuit designed to keep the upper torso afloat, lessening the chances for accidental drowning. Unlike bulky life jackets, these toddler swimsuits are far more streamlined in design, so your child will feel comfortable wearing one both in and out of the water. This eliminates worries that your little one may jump back into the pool without remembering to put his life jacket on first. When choosing a floating swimsuit for your toddler, it's crucially important that the garment fits snuggly. Most of these suits are designed to fit children from two to six years old. If the swimsuit is too large, your child may not weigh enough to remain vertical in the water. If this happens, he could wind up face down, presenting a definite drowning hazard. Test the suit on your child in the water with you, and return it immediately for a smaller size if he appears unstable. Although a floating swimsuit will definitely boost your child's water safety factor, you should never rely on one to babysit your child without your direct supervision. Always be present when your child swims, or be sure a competent adult swimmer is on guard. Enhance your child's float factor by adding water wings to the ensemble. This will help him keep his head even higher above the water. Enroll your child in age-appropriate swim lessons. There are quite a few children's flotation suits on the market. Take a look at a few samples. The Speedo Polywog Swimsuit is a marvel of design. The amount of flotation in each suit is scientifically calculated for each size, and the foam inserts are tapered for a more natural fit. This feature also works to lower your child's center of gravity, helping him remain upright. If that's not already enough, the suit also has a UV protection rating of 50+. Boys and girls toddler flotation suits from CheapSwimmingPoolProducts.com fit children aged two to five years old, weighing from 20 to 60 pounds. These suits also block up to 96 percent of UVA and UVB rays. Yahoo! 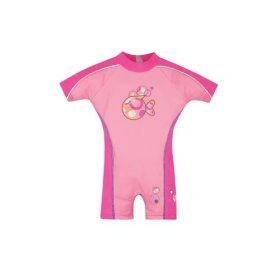 Shopping is the fast lane to a great selection of children's floating swimsuits. Styles vary from tanks to neoprene wet suits.